Oceans cover more than 70% of Earth’s surface and ocean waves carry enormous power. By utilizing the largest source of untapped clean energy, it could supply a substantial part of the world’s electricity. Environmental and climate issues, as well as uncertainty about energy supply, demand that we diversify our energy supply to multiple renewable sources. It needs an effort to make wave energy one of tomorrow’s energy sources. 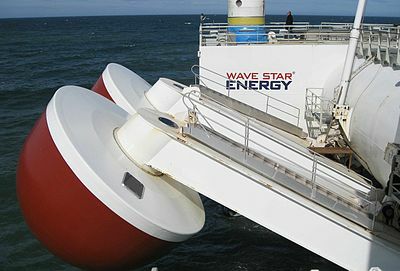 Wavestar Energy is a commercial Danish company for the utilization of wave energy. The concept was invented by the two Danish brothers, Niels and Kjeld Hansen in 2000. The challenge was to create a regular output of energy from ocean swells and waves that are 5-10 seconds apart. Since, 2003 Wavestar Energy has been dedicated to the development of a reliable, commercial wave energy technology. The fundamental basis of Wavestar differs from that of other wave power concepts. The Wavestar machine does not form a barrier against the waves – with a view to harnessing all their energy – but cuts in at right angles to the direction of the wave. Hence, the waves run through the length of the machine and the energy is utilized in a continuous process. On each side of Wavestar machine, there are a number of arms and floats, which are submerged in the water. When a wave rolls in, the floats are pressed up and down. Every time a float is raised, a piston presses oil into the machine’s transmission system which drives a hydraulic motor connected to a generator that produces the electricity. The Wavestar generates electricity even from very small waves. For the 1:10 model, waves only need to be 0.10 m high. Calculations and tests show that the machine produces energy around 90 percent of the time, and that it will run on maximum power 30 percent of the time. The machine has an efficient storm protection concept; when the waves reach a certain height, the floats or even the whole machine is automatically lifted up. This machine could also be installed together with a wind turbine which would increase efficiency, reduce costs and increase the energy production per km2. With the 500 kW machine in development, the company has claimed a position among the leading alternative energy developers in the world. Wavestar aims to make it the first series-produced 1 MW machine for big oceans, ready for sale in 2017. The machine will then be doubled in size, capable of handling twice the wave height. This will increase each machine’s output to 6 MW, enabling a single machine to provide energy for 4,000 homes, says Wavestar Energy. Wavestar is in the process of documenting the impressive results of the new PTO (power take off) system. The system will increase the efficiency of the wave energy machine significantly. This is a crucial factor in making wave energy a competitive source of renewable energy in line with offshore wind. Explore further about this innovative wave energy concept by clicking Wavestar Energy.